Research shows that when parents engage in simple science projects with their kids at home, it boosts their learning in school. Did you know that children spend just 14 per cent of their waking time between Kindergarten and the end of Grade 12 in school? Given this startling statistic, it comes as no surprise that much of children’s learning happens “out there” — in the playground, during extracurricular activities, at a museum, on a walk, via the media, and, perhaps most importantly, at home. I am the director of the Education Community Outreach Centre at Queen’s University and coordinator of Science Rendezvous Kingston. Science Rendezvous is Canada’s largest pop-up science, technology and engineering and mathematics (STEM) festival. I also develop mathematics content for two educational children’s programs, The Prime Radicals and mathXplosion. I have developed two provincial toolkits for parents about inspiring children to learn, love and choose math and I am the “math talk” consultant for MathStoryTime. I have worked for decades to engage parents because I believe that families and schools have much to learn from and share with each other. Schools have formal knowledge of teaching and learning, curriculum, assessment and evaluation. And parents know their children’s motivations, skills and interests. The research also shows that informal environments including the home — also called out-of-school-time [OST] settings — play an important role in promoting STEM learning. They do this by sparking student interest and providing opportunities to broaden and deepen engagement in STEM content. Also see: WATCH: Teach kids about science with this homemade lava lamp! Empirical evidence clearly suggests that OST experiences strengthen and enrich school STEM learning by reinforcing scientific concepts and practices introduced during the school day. These experiences can be in museums, after-school programs, science and technology centres, libraries, aquariums, zoos, botanical gardens and at the kitchen table. OST experiences also promote an appreciation for, and interest in, the pursuit of STEM in school and in daily life. They help learners understand the daily relevance of science to their lives, the depth and breadth of science as a field of inquiry, and what it might be like to choose to do science in the world, either as a professional or a citizen scientist. 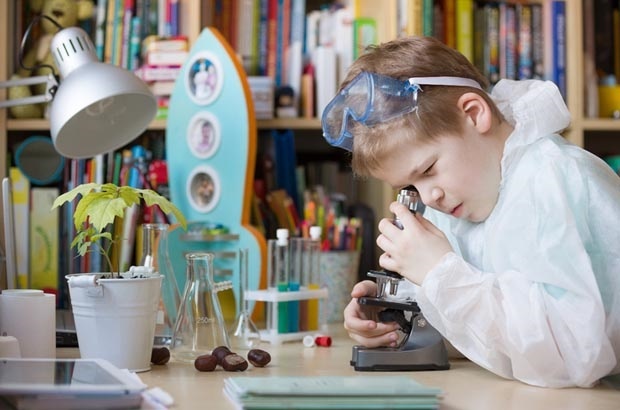 It is no surprise then, that informal science education researchers and educators are actively reaching out to parents, asking them to enthusiastically encourage and support children’s science learning at home, in school, and through their communities. Parents are their children’s first and most important teachers. Their values, beliefs and actions have enormous influence on their child’s educational decision-making and achievement. When parents convey an interest and excitement for STEM subjects, children benefit attitudinally and academically. When parents make it clear that they value STEM subjects and believe it is important to study them, they positively influence the way their child views these subjects and support their child’s academic success in those areas. Informal STEM learning at home is about parents and children exploring science in fun, hands-on ways outside of class. Brief, high-quality parent-child interactions about STEM can make a profound difference to how children perceive STEM subjects and succeed in them academically. One study, for example, showed that when caregivers used a mobile app to bring a little bit of math into the home, their elementary school children showed improved math skills within months. Improvements were most dramatic in families where the caregivers reported themselves to be anxious about math. When parents actively participate in kitchen-sink experiments, they become STEM mentors. When parents become partners by contributing specimens to a child’s leaf or bug collection and then go a step farther by helping their child to categorize those treasures with the help of an illustrated website, they are modelling what scientists do. When parents curl up with their children to read a science book together, such as The Way Things Work by David Macaulay, and then dig out the can opener to take a closer look, they are modelling learning. When families watch age-appropriate television together — like Sid the Science Kid, Project Mc² or NOVA — parents are encouraging connections among STEM topics, everyday life, career possibilities and scientific literacy through their attitudes and actions. Here are two very simple experiments that can be done at home, using everyday household items. You will need: An empty soda can, an inflated balloon and one head of hair. Directions: Place the can on its side on a flat surface (a table or a smooth floor will do). Then rub the balloon back and forth through your hair. Hold the balloon close to the can without actually touching the can. You should see the can roll towards the balloon without touching it! Why does it work? When you rub the balloon through your hair, tiny, invisible particles called electrons (which have a negative charge) build up on the surface of the balloon, creating static electricity. They electrons have the power to pull very light objects (like the soda can) towards them. You will need: A balloon, about 40 ml of water (a cup is about 250 ml so you don’t need much), a soft drink bottle, a drinking straw, the juice from a lemon (or two tablespoons of vinegar) and three teaspoons of baking soda. Directions: Stretch out the balloon. Pour 40 ml of water into the soft drink bottle. Add the baking soda, stirring with the straw until it is dissolved. Pour the lemon juice (or vinegar) in and quickly put the stretched balloon over the mouth of the bottle. If all goes well then your balloon should inflate! Why does it work? Adding the lemon juice to the baking soda creates a chemical reaction. The baking soda is a base, while the lemon juice is an acid, when the two combine they create carbon dioxide gas (CO2). The gas rises and travels up through the neck of soft drink bottle, where it is trapped inside the balloon and blows it up. Here's how anyone can become a maths whizz with Pólya’s method! Try out these science experiments and send us your comments and pictures to chatback@parent24.com. We may just publish them!